SICS Frostwalls are high efficiency liners designed to meet specific insulation or thickness requirements needed to enhance typical (cribbing, ICF, PWF) foundation system or precast building shell performance. Precut for all windows, doors, and openings the supplied sections are simply to place and connect. 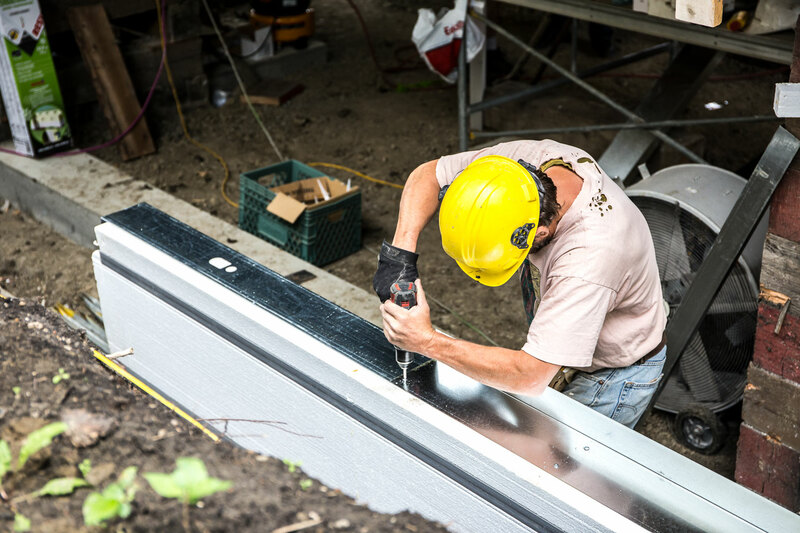 Once installed, sections line the inside face of your foundation to meet your project insulation needs and provide pre-set attachment studs for interior finishes and pre-cut electrical and mechanical raceways for your trades. SICS Skirting Systems provide custom insulation wraps for pad located mobile or site installed modular home support structures. Whether you need basic insulation protection for piping and utilities under a simple block supported mobile home, or a custom prefinished contemporary skirting around the pile supports of a high end manufactured home, our ‘standard’ system can be custom sized and produced to meet your exact needs. SICS Roofing, while not effective or used for traditional residential housing, can provide innovative solutions for insulation of “structure in place” roofs such as sheeted post and beam, pre-engineered buildings, and steel column and beam commercial buildings. Contact us directly with your thoughts or details to discuss efficient and cost effective solutions that may be available or possible for your new or retrofit roofing project.